Ms Lorna Dawson, Programme Director at the Centre, thanked the residents of Lower Estate who helped to ease their concerns in settling into the location by assisting around the centre and helping with moving clients of the centre around. Ms Dawson said that the Centre will be catering to children as well as adults and stated that there were currently five adults attending regular sessions at the centre and the numbers were expected to increase. She commended the staff for their good work in helping to prepare the centre and getting it ready in time for the opening. The new Autism Centre was designed to facilitate the learning needs of persons, particularly those with autism and persons having severe challenges with their communication skills. The facility includes a classroom, kitchen, laundry room and an observation room and according to Government, attendees of the programme will be engaged in other activities as part of their person-centered plan developed to help improve their quality of life. 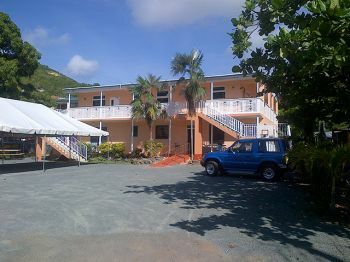 The Rainbow Children's Home was chosen to pilot an autism project for the Virgin Islands through collaboration with the United Kingdom's Kingwood Trust and a financier agreement with the Maria Holder Memorial Trust based in Barbados. On April 24, 2012 Government inked contracts with both groups through which Maria Holder Memorial Trust would have provided US$381,529 for the establishment of the programme and Kingwood Trust would have provided specialist support and training. “Parents, caregivers and professionals now have an avenue in which to learn and become better equipped to cater to the needs of the autism population in the BVI. My Government is keen to begin this new direction with a sense of renewed hope for children as well as adults with autism,” Premier Dr. The Honourable D. Orlando Smith had said in April. Meanwhile, Minister for Health and Social Development, Hon. Ronnie Skelton had said the autism programme would be offered free to persons and would initially run for a period of 18 to 24 months. Government, he said, would provide the necessary funding and support for the project, including renovating and enhancing the Rainbow Home. It was pointed out at the time that there are some 8 adults and 25 children diagnosed with autism. this decisions is a good one no one can say its either shortsighted or made for other reasons best known to the decision-makers....big up to the NDP on this one! While I will join in on the big ups to the government on this I hope its not a half bake project and the facility will provide for their all-round development by lighting the spark in the minds of the children, by empowering the parents to fan the flames and by teaching all the skills – intellectual, vocational, social, spiritual and emotional – they can master. YOU PEOPLE ARE JUST EMBARASSING YOURSELF HERE. Just look at what it took to get this done. SMDH! Softer as sheep's wool but he's still a WOLF IN SHEEP'S CLOTHING!! Kudos, this is a great move that was much long overdue. I just wished more of our buildings were handicap friendly. There are subtle signs of autism if you just look for them," said neuroscientist Karen Pierce of the University of California, San Diego, who led the study. "Let's just get these kids detected early and treated early."